The USGS National Water Information System (NWIS) contains extensive real-time and historical surface-water data for the Nation. When looking at the location of rivers and the amount of streamflow in rivers, the key concept is the river's "watershed". What is a watershed? Easy, if you are standing on ground right now, just look down. You're standing, and everyone is standing, in a watershed. A watershed is an area of land that drains all the streams and rainfall to a common outlet such as the outflow of a reservoir, mouth of a bay, or any point along a stream channel. Watersheds can be as small as a footprint or large enough to encompass all the land that drains water into rivers that drain into Chesapeake Bay, where it enters the Atlantic Ocean. This map shows one set of watershed boundaries in the continental United States; these are known as National 8-digit hydrologic units (watersheds). The word "watershed" is sometimes used interchangeably with drainage basin or catchment. Ridges and hills that separate two watersheds are called the drainage divide. The watershed consists of surface water--lakes, streams, reservoirs, and wetlands--and all the underlying groundwater. Larger watersheds contain many smaller watersheds. It all depends on the outflow point; all of the land that drains water to the outflow point is the watershed for that outflow location. Watersheds are important because the streamflow and the water quality of a river are affected by things, human-induced or not, happening in the land area "above" the river-outflow point. Animation of water draining from neighboring basins. Most of the precipitation that falls within the drainage area of a stream's USGS monitoring site collects in the stream and eventually flows by the monitoring site. Many factors, some listed below, determine how much of the streamflow will flow by the monitoring site. Imagine that the whole basin is covered with a big (and strong) plastic sheet. Then if it rained one inch, all of that rain would fall on the plastic, run downslope into gulleys and small creeks and then drain into main stream. Ignoring evaporation and any other losses, and using a 1-square mile example watershed, then all of the approximately 17,378,560 gallons of water that fell as rainfall would eventually flow by the watershed-outflow point. Precipitation: The greatest factor controlling streamflow, by far, is the amount of precipitation that falls in the watershed as rain or snow. However, not all precipitation that falls in a watershed flows out, and a stream will often continue to flow where there is no direct runoff from recent precipitation. Soil characteristics: In Georgia, clayey and rocky soils of the northern areas absorb less water at a slower rate than sandy soils, such as in Georgia's Coastal Plain. Soils absorbing less water results in more runoff overland into streams. Soil saturation: Like a wet sponge, soil already saturated from previous rainfall can't absorb much more ... thus more rainfall will become surface runoff. Land cover: Some land covers have a great impact on infiltration and rainfall runoff. Impervious surfaces, such as parking lots, roads, and developments, act as a "fast lane" for rainfall - right into storm drains that drain directly into streams. Flooding becomes more prevalent as the area of impervious surfaces increase. Slope of the land: Water falling on steeply-sloped land runs off more quickly than water falling on flat land. Evaporation: Water from rainfall returns to the atmosphere largely through evaporation. The amount of evaporation depends on temperature, solar radiation, wind, atmospheric pressure, and other factors. Transpiration: The root systems of plants absorb water from the surrounding soil in various amounts. Most of this water moves through the plant and escapes into the atmosphere through the leaves. Transpiration is controlled by the same factors as evaporation, and by the characteristics and density of the vegetation. Vegetation slows runoff and allows water to seep into the ground. Storage: Reservoirs store water and increase the amount of water that evaporates and infiltrates. The storage and release of water in reservoirs can have a significant effect on the streamflow patterns of the river below the dam. Water use by people: Uses of a stream might range from a few homeowners and businesses pumping small amounts of water to irrigate their lawns to large amounts of water withdrawals for irrigation, industries, mining, and to supply populations with drinking water. This pool cover is an example of a watershed. All of the rain that falls into this area flows inside of the cover, in this case towards the center. Credit: Howard Perlman, USGS. Public domain. You're expecting to see a picture of a watershed — so why am I showing you a picture of a common swimming pool in winter with a pool cover? This covered pool is really a good example of a watershed. The blue cover represents the watershed, the area in which precipitation that falls flows "down-gradient" towards the lowest part of the basin, the center of the pool cover in this case. Likewise, in nature, water flows towards a valley, river, or lake. The lake in the center of the pool forms for the same reason that a lake will form on the landscape — it is the lowest area around and the water comes in, through a river, seepage into the ground, or by evaporation, faster than it can get out. In most valleys, the land slopes downhill somewhere, in which case, a river will form. Do you see why this pool cover is not exactly the same as a real drainage basin? There is no outlet for water to exit the "watershed", as almost all watersheds have, such as a stream flowing out of the watershed. Thus, in our pool watershed, you can see how a large "lake" is forming. Below are other science projects associated with watersheds and drainage basins. How Does the USGS Collect Streamflow Data? The USGS follows four basic steps for collecting streamflow data. The following example uses a streamgage though more portable methods are also frequently used. Read on to learn more. Water is nature is never really totally clear, especially in surface water, such as rivers and lakes. Water has color and some extent of dissolved and suspended material, usually dirt particles (suspended sediment). Suspended sediment is an important factor in determining the quality of water. Rain and snow are key elements in the Earth's water cycle, which is vital to all life on Earth. Rainfall is the main way that the water in the skies comes down to Earth, where it fills our lakes and rivers, recharges the underground aquifers, and provides drinks to plants and animals. The banner picture shows it all — Superhighways! Streets and pavement! Driveways! House roofs! These are all "impervious surfaces"; impervious to the water from precipitation. When it rains in this locale, water no longer seeps into the ground, but now runs off into storm sewers and then quickly into local creeks. Localized flooding is too often the result. Below are publications associated with watersheds and drainage basins. 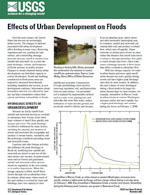 Effects of Urban Development on Floods; 2003; FS; 076-03; Konrad, Christopher P.